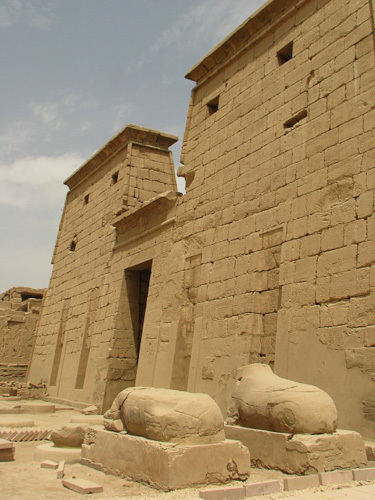 The Temple of Khonsu at Karnak (c.1100 B.C.) is an excellent example of a small but complete New Kingdom Temple. It was dedicated to the moon god Khonsu who was the son of Amun and Mut. Its layout, spatial sequencing and lighting effects are all a testament to the powerful religious ideals of the ancient Egyptians. By designing the architecture around strong axial alignments, bi-lateral symmetry and simple masses the architecture becomes a visual expression of the hierarchal and unchanging nature of the social and religious customs. Though the use of the arch was known as early as the fourth dynasty post and lintel construction was preferred for all monumental construction. But because of the poor tensile strength of stone the lintels had to be supported by closely spaced massive columns and covered with simple flat roofs. When this type of construction was illuminated by the strong desert sun strong contrasts in light and shade were created. Strong shadows were cast across the cylindrical columns, walls and ground plane creating a wonderful, animated play of light that contrasted with the bright shadowless areas. The temple is organized around a strong central axis that moves through a series of ever-increasing sacred and intimate spaces. The type and quantity of light was also correspondingly manipulated. The power of these spaces and lighting effects can be best understood in the context of a description of how the architecture was used during festivals and religious ceremonies. During most festivals a large procession of commoners and priests headed by the pharaoh would approach the temple. The walls of the pylon were edged with torus moldings, crowned by a cavetto cornice, and decorated with masts for royal banners. It was meant to portray the power of the gods and of the pharaoh. In the center of the pylon is a modest opening through which only the pharaoh, the priests, and high-ranking officials could pass. The opening created a strong sense of threshold that signifies that one is entering a sacred precinct. Once the procession passed through the gateway they found themselves in a high-walled enclosure with two rows of massive colonnades on either side of the center pathway. Open to above the strong Egyptian sunlight poured in to the center of the space while the roofed perimeter was immersed in shadow. The change in light prepared the procession for the coming darkness of the inner spaces. Next in the progression of spaces is the hypostyle hall with its filtered light from its screened clerestory windows. Enclosed by full-height walls, the roof was supported by eight free-standing columns. The lower light level and filtered quality is a profound change from the previous courtyard space. The spaces became progressively smaller, shorter, darker, and holier. Correspondingly, the entourage gets progressively smaller with only the highest ranking officials proceeding forward. 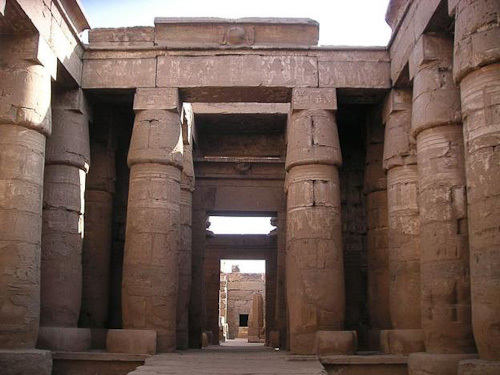 The next space was the Hall of the Barque that displayed the barque that was used to transport an effigy of Khonsu from the Amun Complex of Karnak to the temple at Luxor. The final space behind the Hall of the Hall of the Barque was the Pronaos. It was the smallest and holiest space as it housed the effigy of Khonsu.